All interested UK-based readers should have seen the final episode of the Great British Sewing Bee by now. (If you didn't, you can catch it here for three more days.) What a final it was! You may have seen that I accompanied Mum* on the night of the final challenge, but as I hadn't seen what went on before the winner was announced, and Mum wasn't there (for the first time), it was the only episode I watched with no prior-knowledge of the challenges. I'll admit that until I saw this episode, the result had me a little surprised. You'll already know from previous weeks that if I'd been a judge, Heather and Tamara might not have made it to the final, but there was no point at which I'd thought Chinelo would go. Knowing that Heather had won the title, I was interested to see what had happened during the final week to make so much difference - she had progressed through the competition in the middle of the pack until then - nothing truly outstanding, no garments of the week, but also nothing that got her evicted by the judges. Just bucket-loads of laughs... and, from what she said on the show, gin! I would say the final episode really showed that slow and steady can win the race - it was the hare and the tortoise all over again. Based on the three challenges in the final week, Heather absolutely deserved to win the title - she saved the best for last with a fabulous 'dressage-inspired' evening gown. Heather's triumphant design coincided with a difficult week for Chinelo, and a big risk from Tamara that just didn't pay off. (I think it really could have gone either way for Tamara as the judges loved some of her other less conventional garments - I'm thinking particularly of the shirt-to-skirt conversion in one of the early episodes, which they adored). On the night, Heather's reaction was exactly as it looked on TV, one of complete and utter genuine surprise to have won - modest and utterly charming. I promised last week that there'd be an interview with one of the finalists. I really wanted to talk to Chinelo before she got inundated with other things, as I know SO many of you have enjoyed her creations and been inspired by her freehand cutting. 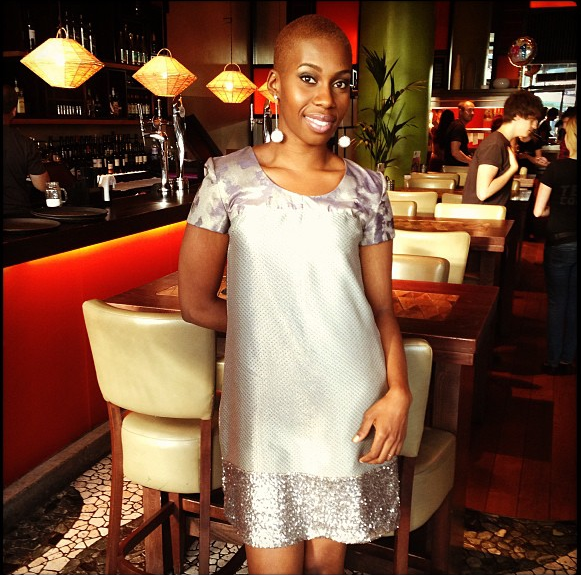 It's taken longer than planned due to technical issues, but I'm delighted to welcome Chinelo Bally to the blog. Hi Chinelo and welcome to Crafts from the Cwtch. Firstly, congratulations on making it through to the final of GBSB. Can you tell my readers a little about your background and how you first got into sewing? Hi Sarah, I’ve been sewing for just under 3 years now and it all started with me not able to find tops that I really like in the shop so I decided to make my own. When I got my first second-hand sewing machine, it sat on the dinning table for 3 months after 2 failed attempts at making a top for myself without a pattern. I finally decided to learn how to sew, so I went to aunt who is a tailor and shadowed her whilst she did dressmaking for her clients. I was really fascinated by the way she worked and instantly fell in love with the idea of making my own clothes over again. During the competition, you demonstrated a real flair for design and your garments have a strong identity - flattering shapes and figure-hugging lines are prevalent. Have you always been interested in clothing/fashion? Who has inspired your style? Are there any designers that you particularly like? I have always loved fashion and always did quirky little adjustments to my store bought clothes so learning to make my own from scratch was just perfect for me. Fashion is a big part of my life, I love to look good and love to make other women look and feel good. My favourite designers are Tony Ward and Christian Dior; I love the detailing in their garments and how feminine all their silhouettes are, Victoria Beckham is another one of my favourites; I love how tailored her clothes are. I draw a lot of influence from things around me and being a British Nigerian, I would say that my style is a hybrid of these two cultures. I can't interview you without asking about your wonderful earrings. Even my husband, who has no fashion-sense or interest in jewellery, has been commenting on them each week! How many pairs of enormous earrings do you have? Do they all come from one shop? And which are your favourites? I don't sew, but knit a lot of my things without patterns (or write them myself) so in my own way I can relate to your freehand style of cutting garments. How did you learn to work this way? And is it something you think is easy to pick up, or is it just something that some people find easy and others don't (which seems to be the case with knitting)? Do you make all (or most) of your own clothes and what is your favourite garment that you've made for yourself to date? Are there any other crafts which interest you? Beading and Knitting interests me (your mum was going to teach me on set so maybe you can teach me now), I can do the basic knit but nothing as fabulous as Lynda’s technicoloured shawl. I really love baking but I’m sure that’s not a craft!!!! Once my mum left the competition, I felt 100% sure you would win - I know I'm not the only one. How did it feel to get so close to the title, only to be pipped at the post by Heather? And what was it like watching it back on the TV? To be honest I did really think your mum would be a finalist also. I felt really proud of myself for having made it to the finals with such accomplished sewist. Obviously I wanted to win; I’m sure we all did, but Heather was a great sewist and she really deserved her win. 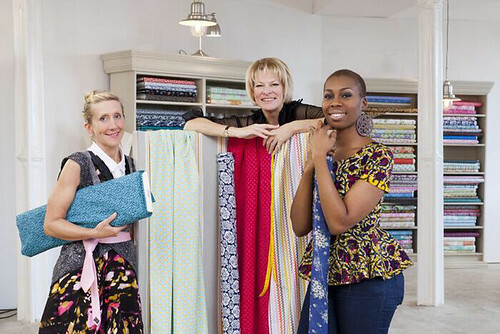 What have you learned (about sewing and about yourself) from taking part in the Sewing Bee? 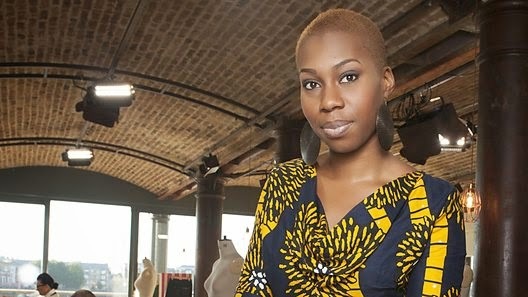 I have learnt that I’m a fighter because each week I battled for my place on the Sewing Bee. I picked up a lot of handy tips from the other sewers which has been useful for my personal projects. I am sure you have a very bright future ahead, and that the GBSB will be a great springboard for future projects. What are you working on at the moment, and what do you have planned for the future? 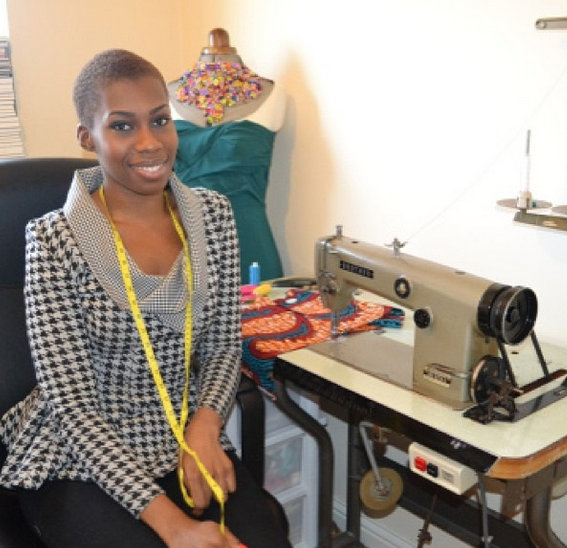 I’m currently working on my women’s wear line (the website will be launching very soon) but I am taking bespoke garment orders and teaching people how to sew free hand. Now that we won't be seeing you on our screens each Tuesday, where can find you? I’ll also miss The Sewing Bee - not quite sure what I’ll do with myself on Tuesday nights. I write a blog where I offer some freehanding tutorials. There are lot of exciting things in the making and you can stay updated by following me on twitter. I have an instagram page where I post some pictures of my projects. I am currently running workshops, current dates are sold out but new dates will be posted next week, so keep an eye on my twitter. Thank you so much for taking the time to talk to us. I'm sure my readers will join me in wishing you the very best of luck with your future projects. Thank you very much and thank you everyone who rooted for me during the Sewing Bee. *Many of you spotted Hitchkiker which Mum was wearing, but only two eagle-eyed people spotted the Color Affection I had on, which was visible for a few seconds in the background of one of the shots. Well done! Oh so that was deliberate. Yay! What a good idea! Brilliant interview - Chinello was certainly a well deserved finalist but Heather's joy was so pure I could not help but feel happy for her :) I bet it was lovely to meet all the contestants through your mum, and I still remember shouting at the TV when she was sent home! Great interview! I had no idea one could cut freehand like that, I will definitely try it. Because of the popularity of the Sewing Bee, Norwegian broadcasters have bought the idea and it will air next year, yay! Too bad knitting is too slow for something like that, but we actually had a national knitting evening: 13 hours slow-TV with knitters and knitting. What a great interview. I thought Chinello was amazing as she never required a pattern. Thanks for the links I will be checking out her blog. Hope you've had a lovely Easter holiday with your family.